Be the first to share your favorite memory, photo or story of Ke'Myrah. This memorial page is dedicated for family, friends and future generations to celebrate the life of their loved one. Our beautiful, loving, sweet-hearted angel has gained her heavenly wings. Ke’Myrah Pashanae Jefferson, affectionately called “Cupcake”, slipped from time into eternity on Sunday, March 17, 2019. Tremendous joy overflowed the hearts of her parents, Derrick Jefferson and Shykela Bingham when their precious baby girl, Ke'Myrah, was born at 4:23 pm on March 3, 2010, in Laurel, Mississippi at South Central Regional Medical Center. 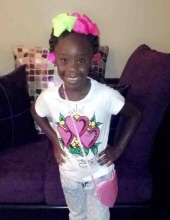 A bright, precocious litle girl, Ke’Myrah attended Harrison Central Elementary School and was an honor student. She was "married" to Kelvin Thompson on February 14th, 2019. Ke’Myrah spent most of her time being a wonderful big sister to her little sisters, Kerious and Kambry. Cupcake's beautiful smile could light up any room and lighten almost any burden. She loved to play games, especially football and basketball. Ke'myrah was very creative and had a passion for writing and coloring. As an honor student, she received medals and awards for her academic achievements. Though her earthly days were few, she brought endless joy and boundless love to our lives. "Cupcake" was preceded in death by her great-great-grandmothers, Ella Mae Bingham; Henrietta Gavin, and Hulda Ducksworth; great-great-grandfather, JC Coleman Milton Gavin Sr., great-grandmother, Mary Harris, and great aunt, Gracie Harris. Ke’Myrah is survived by Superhero Kelvin Thompson (Bianca Baker); her mother Shykela Bingham, stepfather James Smith, father Derrick Jefferson, two sisters, Kerious “Cookie” Jefferson and Kambry “Baby Doll” Smith; grandmothers, Wanda Bingham and Teresa Jefferson; grandfathers, James Harris and Greg McMillian; great-grandfathers, Gary Harris and Ronald Gavin; aunts, Jamayia Harris, Kyrah Matthews, Ashanti Harris, and Alexander Jefferson; uncles, Marcus Harris and Kenyell Cambell. A special great aunt, Tomeka Bingham and special cousin Fadarion Bingham; best friend, Ivacia Williams and a host of other relatives and friends. Visitation will be held from 12:00 noon until 2:00 pm with service beginning at 2:00 pm at Harrison Central Elementary, 15451 Dedeaux Rd, Gulfport, MS 39503. To send flowers or a remembrance gift to the family of Ke'Myrah P. Jefferson, please visit our Tribute Store. "Email Address" would like to share the life celebration of Ke'Myrah P. Jefferson. Click on the "link" to go to share a favorite memory or leave a condolence message for the family.